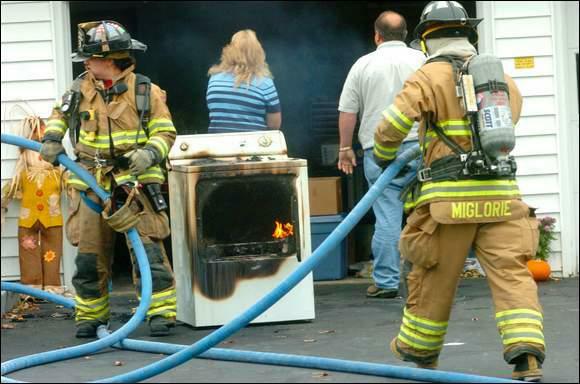 Did you know that the one of the leading causes of house fires are from clothes dryers? According to the U.S Fire Administration, there are 2900 reported fires that were caused from a clothes dryer each year which cause about 5 deaths, 100 injuries, and $35 million in property damage. Dryer fires are caused by the failure to clean them out regularly. Not only should lint be removed from the lint trap on a regular basis, but the vent that is connected to your dryer from the outside should be swept out every 3 months. Have your dryer installed by a professional. This ensures that all the connections are secured, and your dryer is in fact installed correctly. Clean the lint filter before and after each time you use the dryer. Check to make sure the outdoor vent is not covered. You should never over load your dryer. Don’t dry any items that have come in contact with any flammable substances. Don’t use your dryer when you’re sleeping or if you leave the house. If you notice that your clothes aren’t completely dry, that there are excessive amounts of lint in your lint trap, or if you haven’t had your dryer vent swept in over a year, you may need to have your venting cleaned. Contact our office today if you have any questions regarding a dryer vent sweep or if you would like to schedule an appointment with us!